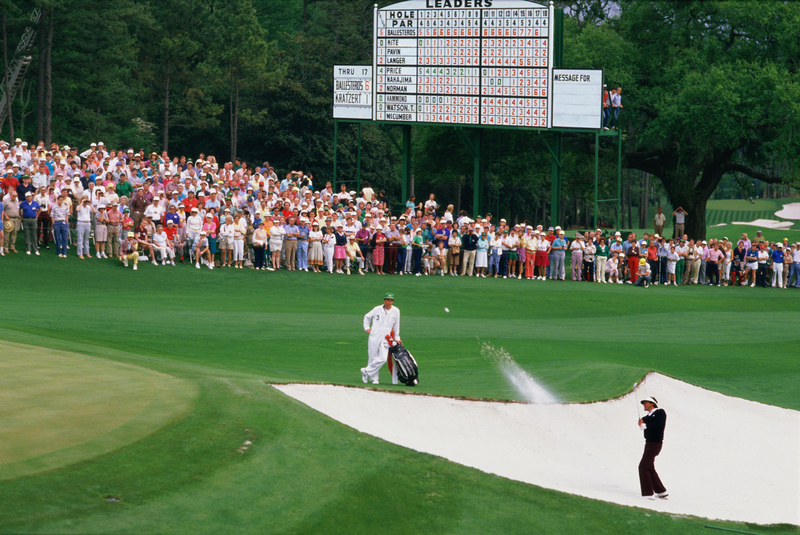 By the time I made that first trip 35 years ago, Augusta’s April week was an increasingly serious part of our own sporting calendar on this side of the Atlantic. Television offered anyone who cared to tune in a ride through the technicolour dreamscape or at least the back-nine holes. Until recently TV cameras were not permitted to show all of the front-nine holes as the club felt this stretch should be partly held back for the exclusive enjoyment of the punters, sorry, ‘patrons’, who had paid money to be physically present. Quaint, nice and, while it lasted, sensationally shrewd once again. Just as Augusta National’s springtime scheduling has been crucial to its turbo-charged, if inflated, development over the last several decades, my own timing turned out to be exquisitely, if accidentally, on the button. Nine months earlier Seve Ballesteros had won The Open Championship at Lytham. He turned 23 at the Masters that week in 1980 and celebrated this happy fact by winning. Young, handsome, gifted, Spanish and exciting he fitted into Augusta’s glamorous folklore as though born for such a role. Which,in many ways, he was. No-one ever has buckled their swash quite like Seve and his victory claimed miles of column inches in the British newspapers. Ironically, the Spanish papers all but ignored this win although a message to Seve from the king of Spain that Sunday evening was something of a small consolation for a man who never had to trip over it to swiftly recognise any sort of slight. While Ballesteros was making his triumphant way over the back nine, Jack Nicklaus came in to talk with the media. Now Jack likes to talk – back then he also liked to bum a cigarette off any journalist while doing so – and the main gist of his discourse in 1980 was that his record of five (at that time) Green Jackets would now ultimately be consigned to history because Augusta was made for Seve and he would definitely win more Masters than anyone. Of course it turned out that Seve won only one more, three years later in 1983. What Nicklaus didn’t say was that Ballesteros had broken through a big barrier with this victory and that the rest of the better European players could now take heart from this win. What none of us knew, what none of us could even dare to hope, was just how much heart these other Europeans would take when Seve walked away with that blazer. This soon became evident as the chaps queued up to win at Augusta and the European era began in earnest. These were invigorating, exciting times and they helped to change everything for the better for the European Tour as well as golf generally outside the USA. The good times weren’t here yet, but they sure as hell were coming. Over the next 20 years six Europeans were to win the Masters 11 times. Eleven! And a slice of heaven if you weren’t American. It was the most dramatic of domino effects and without Seve and his determination to triumph at Augusta I doubt much, perhaps any, of it would have happened. The fact is that Seve liked Americans well enough – especially, it must be said, the women – but he did not like the instinctive arrogance so often displayed by too many of that nation’s golfers at that time, and he saw Augusta National as the natural epicentre of all things American and golf-related. Closer to a shrine than merely an ultra-exclusive, blindingly rich, white golf club with an impossibly pretty course, Augusta screamed superiority. Except that being Augusta there was no screaming, just a quiet expectation that we would all acknowledge its excellence – which, of course, we did. If Seve was to lay down a marker that there was golf, great golf, to be found outside the States then this was his preferred place to do just that. His winning the 1980 Masters was the result of a personal crusade, not just a stunning reward for high ambition and naked skill.